As an individual you can sometimes find yourself isolated, struggling for answers on your own. You might eventually find those elusive answers by searching the internet, hunching over books or stumbling across it months later when you’ve all but given up in frustration. There is a simpler way. Mastermind groups. When a network of peers is formalised into regular meet-ups (either in person, over the internet, or by phone) for the purpose of helping each participant to develop, overcome challenges and meet their goals, it is often referred to as a mastermind. Surround yourself with the right people and you could find solutions falling into your lap. By yourself, you only have your own knowledge and experiences to draw on, but if you join a mastermind group who have been where you are now and know the struggles you are facing, suddenly you have the expertise of several people at your fingertips. The Community Care sector (aged and disability) is a rapidly changing space. Keeping abreast of all these changes is best done when you are part of a team of like-minded people who are dealing with the same issues in a similar context. When you find yourself grappling with an issue, stop and take the time to look around your network. You’ll find that someone else has been down the same road. Talking with a peer can often provide you with guidance on what worked for them and what didn’t. Their journey can save you time and unnecessary stress. contribute to the group, helping others too. Henry Ford and Thomas Edison were two of the members of a mastermind group called the Vagabonds; I imagine the discussions around the table would have been very interesting for this group as they brainstormed ways to overcome issues that arose from developing and marketing their inventions. Some groups and networks may form organically; a few people facing common issues or finding themselves in similar situations who come together regularly and work through the problems. This can be great if you have a small group of people who are focussed on meeting up regularly, live close by and are committed to working through identified issues. The problem is that we are all so busy that it is often difficult to arrange a mutually suitable time, set an agenda and pull together information without a lot of work being done by one or two people. This is where a formal mastermind comes in handy. Donna and I both participate in mastermind groups. We have found that by working with others we gain additional insights and new approaches or strategies that can be applied to our own situation. Often, people in the group suggest ideas or thoughts on a topic that we would not have considered without hearing it from someone else and having them relate their experience and how it helped them. Of course, not everyone’s take on a problem or opportunity is going to be the same, but there are usually some key takeaways that are relevant and sometimes, they can be the ‘gold’, or the ignition you need for your own ‘lightbulb’ moment. While there are plenty of industry-run events and courses, the content of these is rarely tailored to the remote context and the set agenda doesn’t allow attendees to work through issues or develop solutions specific to their own services and situations. 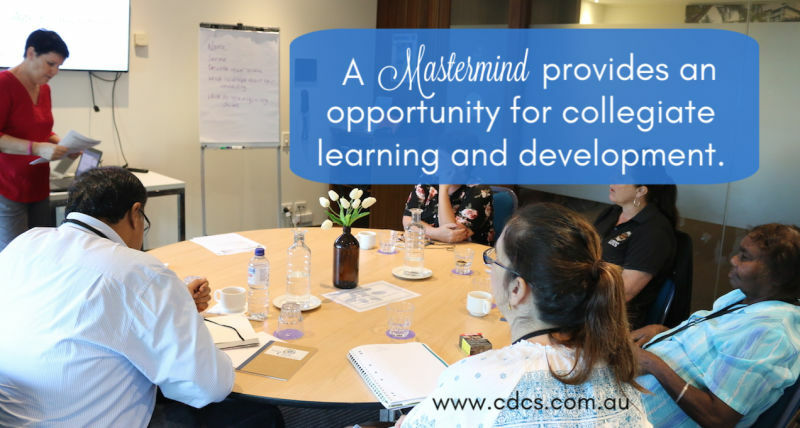 In response to a number of requests from aged care managers, CDCS ran an aged care specific mastermind program in 2018 – the Inner Circle MasterMind. This mastermind program was specially designed to support managers operating community care programs in rural and remote settings. It provided a platform to be able to network with other managers operating in similar contexts who were facing or had experience in related issues, and who were looking to improve outcomes for their clients, their service and staff, and themselves as managers. We were able to respond directly to requests they had such as how to write a better funding submission by bringing in a professional grant writer as a guest speaker. As a group activity, we were able to assist one of the participants work through the restructure of their service, with each participant contributing ideas that made the final outcome effective and actionable. What do you get from being a part of a mastermind group? Mastermind groups are a great way of gaining knowledge quickly and effectively. They are particularly useful when formal learning can’t provide the answers you need. Masterminds promote a faster learning curve. In the feedback we received from a new Inner Circle MasterMind participant who was also new to the role of aged care manager, the person noted they had learnt more in two days by working on issues alongside their peers than they had in the previous two weeks. This is not unusual, as mastermind groups are about collective learning and the structure of a well-run mastermind supports discussion, provides access to expert and operational knowledge, and practical solutions. Mastermind groups are usually made up of people who have a common interest and come together in a collegiate and supportive environment of like-minded people. For example, Donna and I have participated in small business masterminds. This allowed us to interact with other people who were facing situations similar to our own. They may not have understood or had much knowledge about our particular sector (aged care) however they were able to assist us in brainstorming ways to address business-related issues. We all know how valuable networking is. People in our network can alert us to opportunities that we may not be aware of, they might inspire us to look at how we operate our own business, or teach us a simple new skill, but sometimes it is difficult to link up with the right people. While I think it’s good to network with people from other industries or sectors of our industry, the opportunity to build a connection with those who understand your working environment, operational context and who can offer relevant insights and support is invaluable. Being part of a mastermind can help you to stay on track and be more accountable. If you need to report back to the group on how well you are tracking towards your stated goals you’re going to want to have something positive to report. The mastermind group we ran in 2018 helped people to keep on track. One of the participants stated that it was knowing they had to turn up to the two day meet-up every 90 days and report on their accomplishments that inspired them to get those tasks completed. I don’t want to be told that something is good when it’s really not; and although I don’t necessarily like being told something needs to be reworked or it’s not right, I’d rather get some honest feedback and guidance on how I can improve. In the mastermind group I am currently participating in we have a closed Facebook group where I am expected to contribute and upload my work for feedback from others in the group. While this can seem daunting, we’re all in it together and I have had some great feedback, which inspires me to keep going and do better. So how about you? Are you interested in being part of a mastermind group? If so you could always reach out to a few like-minded people, set a time to catch up regularly (fortnightly or monthly is good depending on the availability of the participants) set the parameters of your mastermind and stick with the schedule. It can be a lot of work to manage, but can really pay off. If you are an aged care manager working in rural or remote areas of Australia, you might want to consider joining the 2019 Inner Circle MasterMind group. As well as working with you and your organisation to establish your goals for the year, we will be meeting up in person every quarter for a two-day forum. During these meet-ups, we not only work on current issues, we also bring in special presenters who can provide expert knowledge on current program developments and how they might impact on your organisation; and better still, how you and your organisation can make the most of opportunities. Click here if you’d like to know more about the Inner Circle MasterMind.